Functional Vision Problems: What Happens if Your Child’s Eyes Do Not Focus Like They Should? Sometimes we need to see things far away, and sometimes we need to see things that are nearby. From moment to moment, those needs change. A child at school, may need to see the worksheet on her desk, the equation the teacher is writing on the board, a book on her lap, a list on the bulletin board, a digital tablet, or a big screen video in the front of the classroom. Eye muscles function one way to see close items clearly and they function a different way to see items clearly at a distance. The muscles that focus the lenses in our eyes have to adjust quickly and often to focus on various points of visual interest or sustain that focus over an extended period of time. Otherwise, our vision becomes fuzzy or blurred. If a child has “normal” healthy vision, he or she will have the ability to bring objects of visual interest into sharp focus rapidly and sustain focus as needed. This function is automatic, subconscious, and occurs without extra concentrated effort or strain on the vision system. 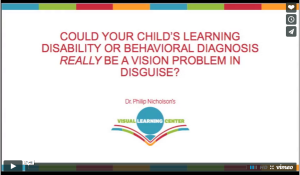 However, children with poor focusing skills have a functional vision problem we refer to as accommodative dysfunction. A child with an accommodative disorder has to put forth extra effort and concentration to bring a blurry object into focus or to maintain focus for a sustained period of time. The child will struggle to bring the text on the page in front of her into focus, and then look up to see blurry text on the board, and struggle all over again to bring it into focus. Her classmates without a focusing problem, will look up at the board and down again at their paper, seeing text clearly each time with no extra concerted effort. Research has shown that elementary students spend as much as 75% of their day looking back and forth from near to far. So it comes as no surprise that a child who has trouble focusing will grow weary, stressed, and frustrated throughout the day. 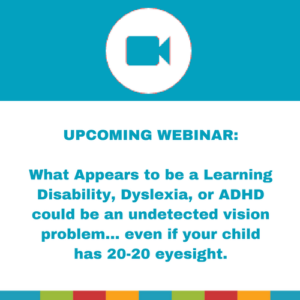 As a result, these children often lag behind in progress and performance, and sometimes they are misdiagnosed with learning disabilities, dyslexia, behavioral disorders, or attention problems. A typical eye exam by your family eye doctor or school vision screening generally only tests clear vision at a distance. Most eye doctors do not test accommodative facility, so it’s possible to have 20/20 eyesight yet still have poor focusing skills. If you suspect your child might have trouble focusing, schedule a functional vision exam with an optometrist trained in developmental vision care right away. If diagnosed, vision therapy treatment can result in significant improvement in a relatively short amount of time.